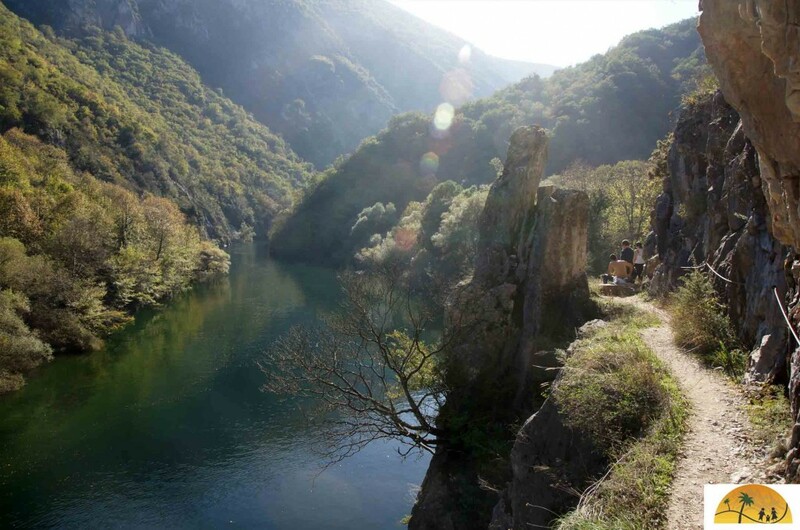 Matka Canyon, only a hop away from Skopje is one of the most beautiful gorges in the region. Bright blue green water flows through the river. High cliffs are rising up from the river and are alternating between bare and overgrown with forest. There is even a small church and a cave in the canyon to see. 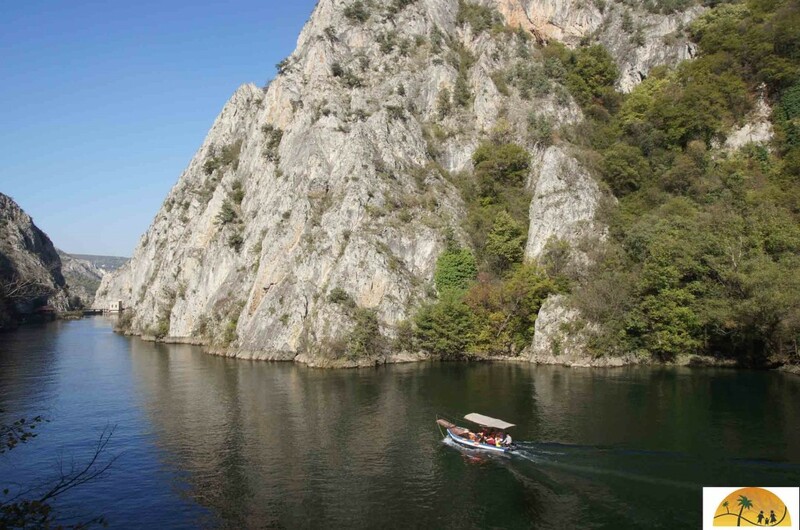 To visit Matka Canyon you can take a bus or taxi from Skopje. In both cases, you will be dropped at a parking area with restaurants on a small river. Before you think “this is it?”, don’t worry as the real beauty is just around the corner. This is the place to do some last minute food and drink shopping. 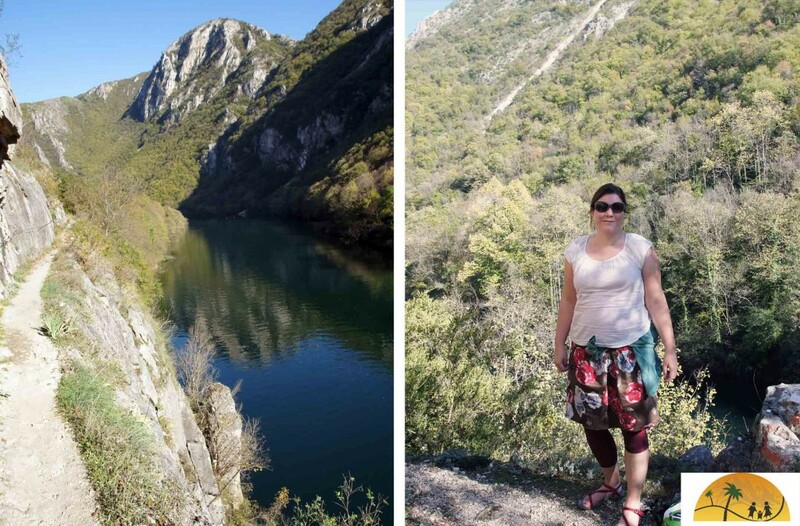 After an easy 10 minute walk, you come to a dam and after that the real canyon begins. First you will reach a square with a small church and (overpriced) restaurant. 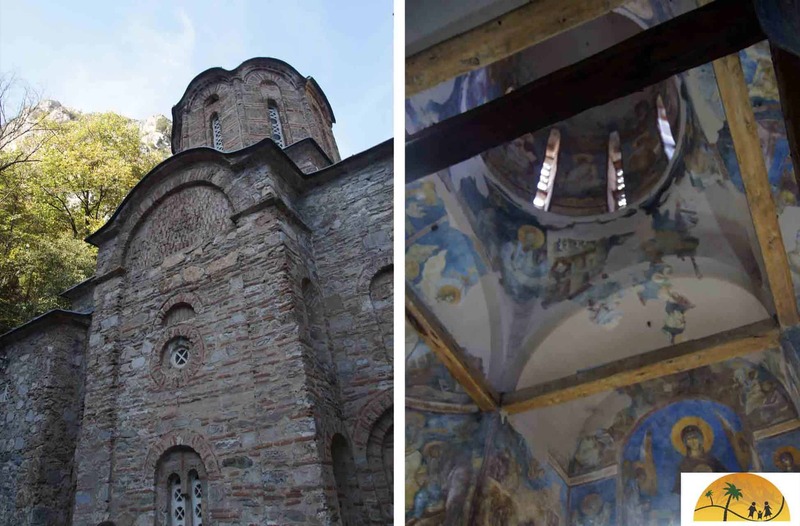 Do have a look inside the Saint Andrea Monastery as it filled with beautiful old frescoes. This is also the place to decide if you want to take a walk inside the canyon or want to explore from the water. I will share my experiences with both options. I set of for my hike in the Matka Canyon in a good mood. I read somewhere that there is a monastery that you can reach by walking into the canyon (this information turned out to be false but I didn’t know this). At the start of the walk there is a sign telling me the path is 6 km long. The first 20 minutes are very easy. The path is still pretty wide and the views are great. I love how the sunlight turns the water from green to blue and back again. When some boys throw rocks in the water I can follow them for a long time. The water is so clear that you can even see the bottom in some places. After a while the path disappears in the forest. Because of the trees I can barely see the water. Only the sound of the motor boats passing by reminds me that the river is very close. By this time there is no more noise from the dam and I can hear several singing birds. Occasionally there are small paths leading straight down to the water. I would love to take one of them to dip my toe in the water. There are however couples cuddled up in every bay and I don’t want to disturb them. The trail climbs again and now that I am out of the forest it is only a very small trail hugging the rock face. The canyon becomes rougher here showing bare cliffs. The views are still great but not suitable for people with vertigo. The trail is barely wide enough to pass other walkers. I am already hiking for 45 minutes and am starting to wonder when I will reach the monastery. I ask a lady, “it is far” and see tells me that it will be around the next bend. I walk a little faster and round the bend. What a disappointment: there is nothing here to see but a cave on the other side of the cliff. I push myself to walk faster and am sure that I am nearing the end of the walk. The canyon is getting tighter and tighter. Suddenly the path becomes almost impossible to walk. It looks like a mini landslide took away part of the path. It has been 15 minutes since I last saw another hiker and my head start to play mind games. “If I fall here what will happen”. Of course I slip and get a big scrape and bleeding ankle. I am just being irresponsible and I turn around. The walk back seems to go faster maybe because I stop less to take pictures. After two hours of hiking I am back where I started. When I reach my hotel I check again on the information. The Dutch guy has clearly never been in Matka Canyon as English websites tell me that the St. Nikola monastery Shishevski is not inside the gorge but on top top of the gorge. Also they suggest taking a guide because the path seems to be rather difficult to find. When I’m back at the starting point there are still boats going out. Now that I have seen the cave from the other side I am curious what is inside. For 400 dinar I join in some people on the boat. The sun is already sinking and the ride is nice although very cold. 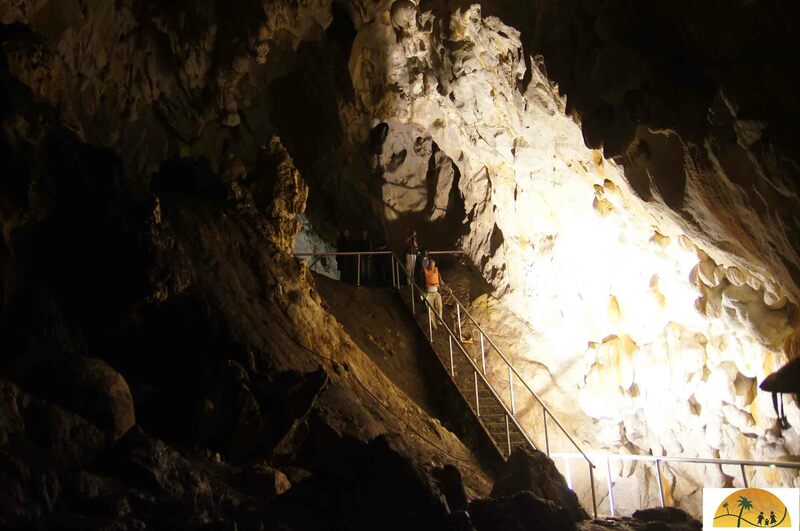 Wondering what there is to see in the cave? I created the following video of the boat ride through the Matka Canyon. 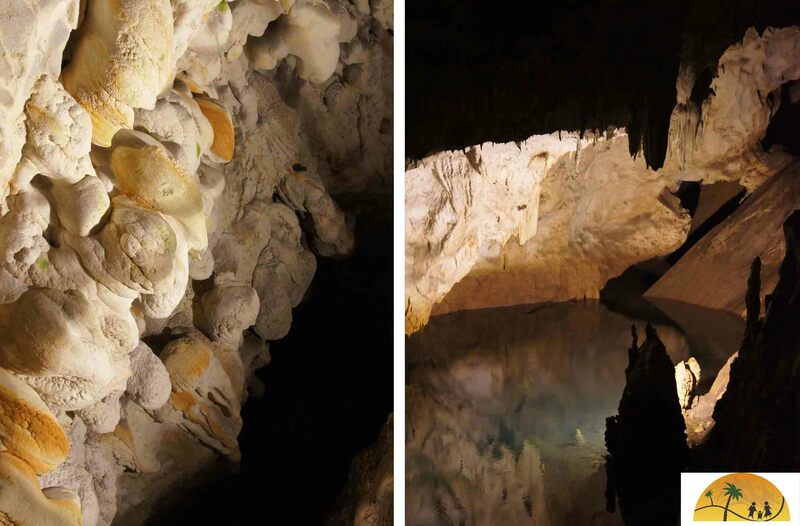 The cave is full of bats and has a large room and a very clear lake inside. Besides taking the motorboat you can also discover the Matka Cayon on your own. There are duo and single kayaks for rent. I also saw people on a paddle board. There is even diving done in the caves. As a tourist you can only join in if you have the appropriate cave diving certificates and make arrangements in advance. I did think walking is the best way to enjoy the different colors of the water and the sunlight playing with it. But a 20 minute walk is enough. With young children, I would not walk but only do the boat trip. This website Gezin op Reis (dutch for travelling family) is mostly in dutch but we have made a selection of our adventures and tips available in English here. Thank you so much for your post! !